Are you looking for cake baking tips - You have come to the right place because there are loads of great baking ideas for you here and answers to your baking questions. 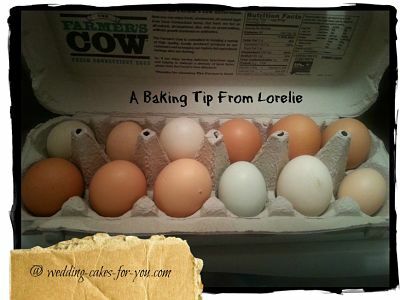 If you forget to take your eggs out to bring to room temperature before baking a recipe, just place them in a bowl of warm water 10-15 minutes prior to adding them to the batter. "I use "pan grease" in my pans. It's a very inexpensive and effective grease/flour mixture. Costs a lot less than any of that spray stuff and is less messy/less of a hassle than the two step grease and flour. 1 cup flour, 1 cup shortening and 3/4 cup vegetable oil. 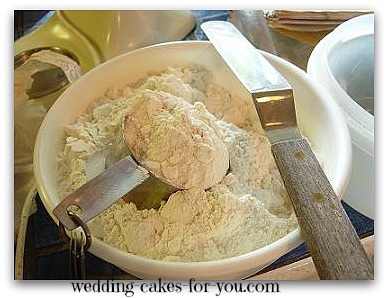 Mix well with a hand mixer till all the lumps are gone, and store in a covered container on the shelf. It lasts 6-9 months. Don't refrigerate. When you need to grease a pan, stir the mixture, then brush on with a pastry brush. After greasing, I also line the bottom of the pan with wax paper. Let the cake cool 10 minutes for a small cake (8 inches or less) and 15-20 for a large cake, but no more. Then turn out as usual." If you prefer the Magi Cake Strips click on the pic to go to the tools and supplies page. You can purchase these and other cake decorating supplies from my website at my affiliate Candyland Crafts. "I am very cheap and did not want to pay for baking strips. What I do instead is wet an old tea towel and wrap it around the pan, it works just the same. Another trick that seems to work for me is decreasing the baking temp a little and increasing the time. (ex- instead of 350 try 325)"
When I cook a large cake the larger the pan the more problems I find but I have the trick to fix them. For a large pan, so it will cook even, or for smaller pans, when you want a flat even top and don't have to shave the top. Prep your pan as usual, best way is spray oil on the pan and baking paper over that - you do not need spray on the paper next to your cake. Have a nice thick news paper to place your cake tin on in the oven. Fold some good thick sheets of news paper (usually need two for a large pan and a second pair of hands to hold two thick sheets in place)to go around the edge. Tie with string. You don't need them wet. I promise they won't burn. Some ladies bake their cakes in wooden pans but that is VERY expensive. 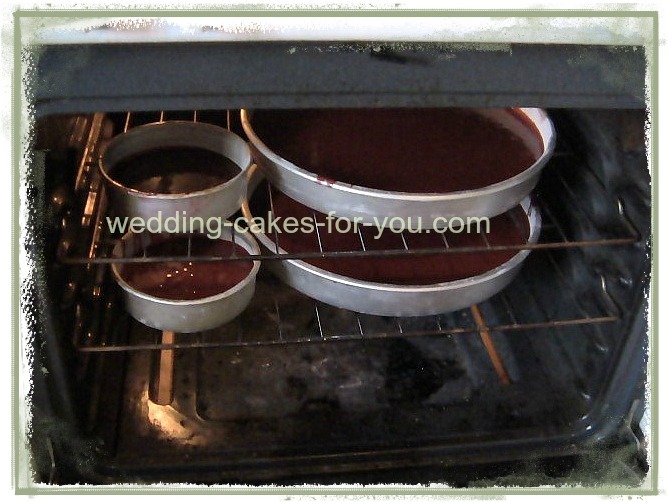 Because you are keeping an intense heat away from the edge and bottom of your cake, they cook very evenly. Problems solved. Flat tops and large cakes get a chance to cook in the middle just like small cakes always do. If anyone finds themselves scratching their heads, let me know and I will take some photo's for you to follow. Another great cake baking tip: If you want to bake a cake that calls for All-Purpose Flour but don't have any in the house, substitute Cake Flour. Add 2 additional Tablespoons of the cake flour to the amount called for in the recipe. "THE CAKE FLOUR WITH 2 EXTRA TABLESPOONS WORKED!! I have just taken the two most perfect cakes out of the oven…no crumbling, no breaking, no sinking and they smell DEVINE! Q: Is there a cake baking tip you can give me on what I can use to make my cakes more fluffy and lighter rather than heavy and dense? Is it eggs that makes it fluffy or milk? 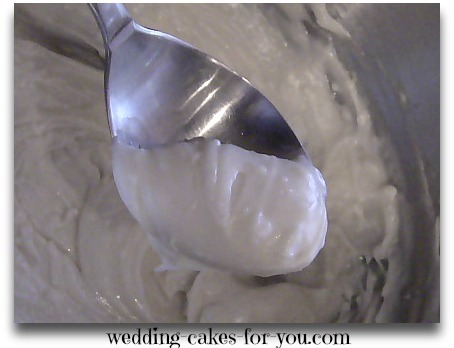 A: The egg whites whipped are what add to the fluffiness of the cakes. The air is whipped into the whites and then folded gently into the cake batter. I emphasize gently so that you don't de fluff the whites. I don't think that de fluff is even a word. But I like it. 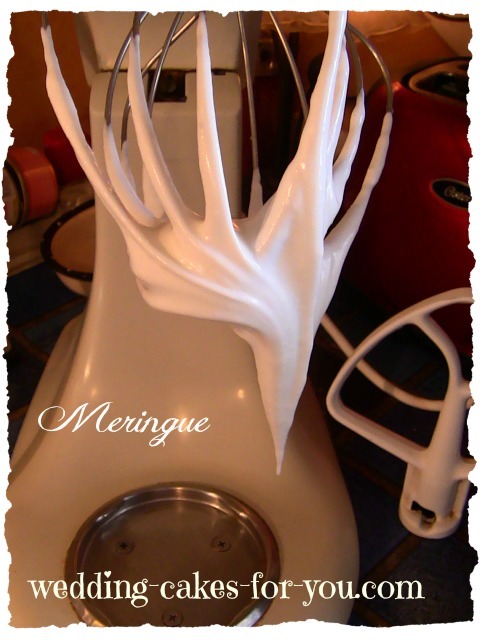 For making a meringue that will be folded into your cakes you can add cream of tartar. 1/4 teaspoon for three egg whites. Resource for high altitude baking. I get many questions about batter amounts, and the number of servings for pans. 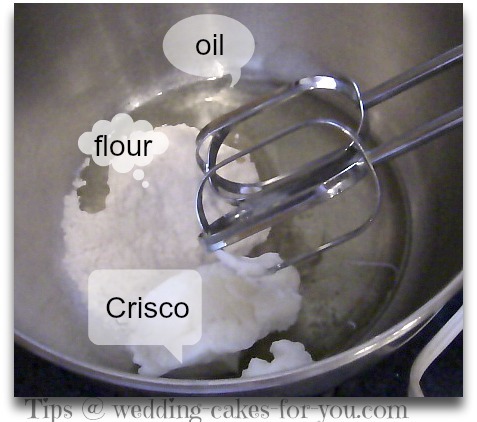 For your convenience I have added some helpful charts below to my cake baking tips page for you. Batter is usually added to about half to two thirds full to allow for the cake to rise. Use these charts as a guide only. For the round and square I gave you an estimate of the party pieces and wedding pieces, with the exception of the 9 inch pan which is not used often for wedding cakes. PIECES are 2 layers with a filling. If you do use a 9 inch you can easily estimate it to be slightly more than an 8 inch cake and slightly less than a ten inch cake. Grandma's cake baking tip - cake tester- No toothpicks in the house? Do it the old fashioned way. Test your cake with a piece of uncooked spaghetti. Prevent batter splatter when mixing your cakes. Spray the beaters with vegetable oil before powering up the beaters and the batter will stay in the bowl. Stain proof your recipe cards. 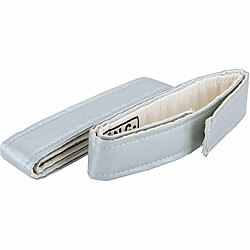 Rub a white candle over the card and it will protect your cards from stains and spills. If you forget to take your eggs out to warm up to room temperature, just place them in a bowl of warm water for 10-15 minutes. Warm up your lemons in warm water if you forget to take them out before using them in your recipe. Then roll them on a hard surface with the pressure of your hands to get the most juice out of them when you squeeze them.